Could you try the same pivot table analysis as LOG12? I had a quick look at the file, tried a few pivot tables, had a short email exchange, and found something interesting. The 2013 US study is “The Role of Conspiracist Ideation and Worldviews in Predicting Rejection of Science” – Stephan Lewandowsky, Gilles E. Gignac, Klaus Oberauer. PLOS one. Hereafter called LOG13. The three authors were the same. Many of the questions were the same, or very similar. LOG12 was an internet survey, conducted solely through “pro-science” blogs. LOG13 was another internet survey, but this time of the U.S. population. LOG12 had just 4 responses. Running 1 to 4 they are strongly/weakly reject and weakly strongly accept. LOG13 had 5 responses. In the middle there was a neutral/don’t know/no opinion option. Conclusions: Free-market worldviews are an important predictor of the rejection of scientific findings that have potential regulatory implications, such as climate science, but not necessarily of other scientific issues. Conspiracist ideation, by contrast, is associated with the rejection of all scientific propositions tested. It is the last part that I will deal with in this posting. Free market views I may come back to at a later time. LOG12 had thirteen questions on conspiracy theories and LOG13 nine. In the latter three were on science issues and one on “New World Order”. That left five that are comparable between the papers, but independent of the scientific / political subject matter1. This can be compared by banding the belief in conspiracy theories by the rounded average response. The first column in the table is the band, taken by rounding the average response to the nearest whole number for the responses to the 5 conspiracy theories. The second column is the unrounded average response within the band. The third column is the number of responses. The fourth column is the average response to the two science questions. The fifth column is acceptance ratio. For the LOG12 survey, conducted via “pro-climate science” blogs, the connection is clear. The belief in the five conspiracy theories is inversely related to belief in two well-accepted scientific hypotheses. However, there is strong acceptance of the two science questions by all but two respondents. The two respondents who were in the highest conspiracy category I referred to as “rogue responses” in my earlier analysis, and which Steve McIntyre called “super-scammers”. Take out the two scam responses and there is a picture of degrees of science acceptance and no science denial. For the LOG13, an internet survey of the American public, there is a somewhat different picture. The belief in three well-accepted scientific hypotheses appears to be related to the strength of opinion for three conspiracy theories, independent of the direction of that opinion. The respondents with the least belief in the scientific hypotheses are those who are in the middle on conspiracy theories. That is those who express no opinion, or give similar weight to both sides. Yet they still are, on average, affirming of the scientific consensus. There is no “rejection of the science” at all by any band of belief in conspiracy theories. Further, the greatest “believers in science” are the 12 who have the greatest “conspiracist” ideation. Like the authors, I have no truck with conspiracy theories. But the evidence does not support the statement “conspiracist ideation, … is associated with the rejection of all scientific propositions tested“. Falsely maligning a group of people will only serve to confirm them in their beliefs. A similar comparison can be made between the beliefs in conspiracy theories and the beliefs in climate science. In LOG12 there appears to be a relationship. 97% of respondents strongly accept climate science and reject conspiracy theories. The 30 who have a modest acceptance of conspiracy theories are a little more lukewarm on climate science. The real odd result are the two scam responses. To clarify, the “Grand Total” row shows that there were 366 scores of 1 in the 5 CO2 science statements. Of these 15 were by the 12 respondents who averaged a score of 5 in the conspiracy theories. The proportions I believe can be better seen by the percentage of responses in each row. So 7% of all the 5005 responses were a score of 1. Of the 60 responses by the strongest believers in conspiracy theories, 25% were score of 1. We get a similar result for belief climate science to belief in three well-accepted scientific hypotheses. Those with the most extreme opinions on conspiracy theories are those with the most extreme opinions on climate change. But there is a crucial difference, in that opinions on climate change are split between acceptance and rejection. The 12 respondents, who were the strongest believers in conspiracy theories, also had the highest proportion of 1s and 5s on the climate questions. The second most extreme group was the 215 respondents on the strong rejection group. The highest proportion of 3s, along with the lowest proportions of 1s and 5s were those in middle band on conspiracy theories. Holding strong opinions on conspiracy theories seems to be a predictor of strong opinions on climate science, but not a predictor of whether that is strong belief or strong rejection. The results of the internet survey confirm something about people in the United States that I and many others have suspected – they are a substantial minority who love their conspiracy theories. For me, it seemed quite a reasonable hypothesis that these conspiracy lovers should be both suspicious of science and have a propensity to reject climate science. Analysis of the survey results has over-turned those views. Instead I propose something more mundane – that people with strong opinions in one area are very likely to have strong opinions in others. In relation to the United States, there is a paradox if you follow the “conspiracist ideation”. Along with being a hotbed of conspiracy theorists, the US is also home to 11 or 15 of the World’s top universities and much of the technological revolutions of the past 50 years originate. If science is about conformity and belief in the established expert opinion, this could not have happened. CYMLK The assassination of Martin Luther King Jr. was the result of an organized conspiracy by U.S. government agencies such as the CIA and FBI. CYMoon The Apollo moon landings never happened and were staged in a Hollywood film studio. CYJFK The assassination of John F. Kennedy was not committed by the lone gunman Lee Harvey Oswald but was rather a detailed organized conspiracy to kill the President. CY911 The U.S. government allowed the 9–11 attacks to take place so that it would have an excuse to achieve foreign (e.g., wars in Afghanistan and Iraq) and domestic (e.g., attacks on civil liberties) goals that had been determined prior to the attacks. CYDiana Princess Diana’s death was not an accident but rather an organised assassination by members of the British royal family who disliked her. Comparing the average scores across the two surveys can be confusing where there are a different number of options. The acceptance ratio makes average scores comparable where there are a large number of responses. Strong acceptance scores 1, strong rejection -1 and the mid-point 0. CdueGHG I believe that most of the warming over the last 50 years is due to the increase in greenhouse gas concentrations. CseriousDamage I believe that the burning of fossil fuels over the last 50 years has caused serious damage to the planet’s climate. CO2causesCC Human CO2 emissions cause climate change. To replicate my response table, create a pivot table for count of responses for each of the climate change statements. Make the conspiracy bands the row labels, and a climate statement as the column label. Add the results together. Australian Climate Madness blog points to an article, “Wrong way, go back“, in the Australian Newspaper by Skeptical Environmentalist Bjorn Lomberg on Australia’s climate policies. This is my comment. When economists estimate the net damage from global warming as a percentage of gross domestic product, they find it will indeed have an overall negative impact in the long run but the impact of moderate warming (1C-2C) will be beneficial. It is only towards the end of the century, when temperatures have risen much more, that global warming will turn negative. Now consider the Apocalypse Delayed? posting of March 28th. Referring to an Economist article, it says that a number of empirical studies show that climate sensitivity is much lower than the climate models assume. Therefore, moving into the net cost range seems much less likely. calculates the total costs (from heat waves, hurricanes, crop failure and so on) as well as the total benefits (from cold waves and CO2 fertilisation). I would claim that the destablisation of the planet’s climate by rapid warming has very little evidence. Claims in AR4 that hurricanes were getting worse; that some African countries would see up to a 50% reduction in crop yields by 2020; that the Himalayan Glaciers would largely disappear by 2035; that the Amazon rainforest could catastrophically collapse – all have been over-turned. Thus the policy justification for avoiding climate catastrophe as a result rising greenhouse gases is a combination of three components. First, a large rise in temperatures. Second, the resulting destablisation of the climate system having net adverse consequences. Third, is that the cost of constraining the rise in greenhouse gases is less than the cost of doing nothing. It is only this third aspect that Bjorn Lomberg deals with. Yet despite that he shows that the Australian Government is not “saving the planet for future generations”, but causing huge net harm. Policy-making should consider all three components. That there will be a significant amount of global warming. That this is net harmful to the planet and the people on it. That the net harm of policies is less than the net harm of warming. To use a medical analogy, the pain and risks of treatment are less than the disease. and editorial of March 30th conversely challenges the quantity of warming from arising from a given rise in CO2, but just sees it as “apocalypse delayed” and not “apocalypse debunked“. A new paper in PNAS entitled ‘Using data to attribute episodes of warming and cooling in instrumental records’ looks important. Ka-Kit Tung and Jiansong Zhou of the University of Washington report that anthropogenic global warming has been overcooked. A lot. My prediction is that this paper will turn out to have exaggerated the anthropogenic influence, rather than have under-estimated it. That meant global CO2 emissions increased more than 12 times (1100%) in 100 years. The conversion rate to retained CO2 seems to be roughly constant – 4Gt of carbon equivalent to increase CO2 levels by 1ppm. Furthermore, the C20th warming was nearly all in two phases. 1910-1945 and 1975-1998. Rather than temperature rise being related to CO2 emissions, it seems out of step. That would imply a combination of two things for the anthropogenic warming rate to be constant at 0.07–0.08 °C/decade. First is that CO2 has massively diminishing returns. Second is that CO2 emissions alone have a much smaller impact on the global average temperature changes (as reported in HADCRUT4), than this paper concludes. The CO2 levels are for Mauna Loa back to 1959, and estimated backwards from there to 1780. The above chart shows by estimated CO2 emissions (expressed in units of 10Gt of carbon equivalents) shown as against the HADCRUT3 data set. This shows a slow rate of increase in CO2 emissions in the first half of the twentieth century, with falls in emissions during the Great Depression (1929-1933) and at the end of the Second World War (1945). From 1950 to 1973 there was a huge upsurge in emissions with the post-war economic boom, then stalls in 1973 (The OPEC oil embargo) and 1980-83 (global recession). After 2000 there was another surge in emissions, mostly due to rapid growth in China. The temperature increases followed a different pattern. There were two periods of increasing temperatures in the twentieth century – From 1910-1945 and 1975-1998. The decadal changes graph below shows clearly the change in emissions. The temperature changes by decade exaggerate the falls in temperature in the Edwardian decade and the 1940s. What is clearly illustrated is why I believe the anthropogenic influence on temperature was not similar in every decade from 1910, as Ka-Kit Tung and Jiansong Zhou claim. Are Climate Change and Obesity Linked? Judith Curry has a (somewhat tongue-in-cheek) look at the links between climate change and obesity. One of the two references is to the care2 website. Rising inactivity is commonly thought to be due to less manual work, the rise of the car and evermore staring at the TV or computer. If a rise of 0.8C in temperature were a major factor then in Britain you would see (for instance) the Scots being more active than those in the South of England, or people being more active in winter than summer. In both cases the opposite is true. Drought-induced high prices would have to show that droughts were the main cause of high prices of health foods compared to junk foods. Maybe convenience and taste have something more to do with the preference for unhealthy diets. Also you would need to show that rising food prices are connected to decreasing crop yields. Biofuels may have more with the rising food prices. Food insecurity diminishes as per capita income rises, whilst obesity increases. That is the poorest of the world have hunger as a problem, whilst the rich countries have obesity as a growing problem. Obesity may be a problem of the poor in the developed nations, but food as a whole is not a problem. Kuhn Vs.Popper: The Struggle for the Soul of Science – Steve Fuller 2003 Page 46. This is backed up by a number of studies of religions, both ancient and primitive religions from various parts of the world. This includes from Fiji and Papua New Guinea. I can find no reference to the major religions of Islam, Hinduism or Buddhism. There is only one biblical reference, from the Old Testament book of Job, but none from the New Testament – the stories about Jesus and his disciples. Neither is there a distinction between Catholicism and Protestantism, nor a split between evangelical and liberal protestants. The majority of the religious sceptics in the USA are the Protestant Evangelicals. Their type of Christianity is centred on biblical study, both individually and corporately, to perceive the revealed word of God and the interpretation for current circumstances. There are the specialists – the ordained pastors – who provide interpretations through sermons. However, this is just the lead for personal study and reflection. Collectively, these evangelicals are not unified body theologically. For instance, a quick comparison of the Southern Baptist Convention and the Assemblies of God websites will quickly demonstrate the point. Nor are there strong ecumenical links between the major churches, as found in Britain. This bible-based view of Christianity comes directly from the Reformation. In medieval Europe the Bible was handwritten and only available in Latin. With most people illiterate, reading of the Bible was limited to a few dedicated scholars, with interpretation highly centralised and strictly controlled. Any deviation was treated as heresy, often punishable by death. A combination of the advent of printing and translation into the vernacular suddenly made the word of God accessible to a much wider population. It soon became evident that the established religious orthodoxy was, in many places, unsupported from the sacred text and in some cases fundamentally at odds with that text. It was this need to study that changed public worship so dramatically, with teaching replacing the Mass as the centrepiece. Politically, access to the Bible democratised understanding and the questioning of authority and centralised power. This gave a scholarly impetus to the development of modern science, and also the Liberal political philosophy of John Locke and the Scottish Enlightenment that in turn heavily influenced the Founding Fathers. (Southern Baptist Convention). The scepticism towards climate change comes from its presentation. It comes across as a core doctrine that is agreed upon by a consensus of leading scientists. But the truth cannot be perceived by the lay person, but only revealed by impenetrable computer models to scientific experts. Any deviation or questioning of core doctrine is treated with contempt and as a heresy. Yet the high scientific standards that these experts are supposed to follow has been found wanting. There are two areas where this is demonstrated most. First, the poster hockey stick of a decade ago – showing global temperatures were dramatically higher than at an time in the last millennium – was investigated by the Steve McIntyre. He showed the results were as a result of a number of elements including cherry picking data; giving undue weighting to favourable results; excluding some unfavourable data points; failing to apply proper statistical tests. A book charting this episode is found here, and my comparison of an exchange following a savage book review is here. Second is the Climategate email release, which showed that the core scientists were a fairly small group, that they viewed the science as far from settled, and they adhered to lower standards of scholarship than was the public perception. Donner has either little understanding of mainstream Christianity in the USA, or he deliberately misrepresents what it stands for. In so doing, he not only completely misses the point of why religious Americans are sceptical but does so in such a way that will make them more antagonistic. The fact that peer review should allow through a paper that clearly does not have proper argument to support the thesis shows a failure to of that process. That a person with no qualifications or prior publishing record in the field of sociology or theology should be allowed to publish on the subject in a journal specialising in the weather shows how far climate science is straying beyond its area of competency. For Christians who unsure of the global warming arguments, clear evidence that a climate scientist not knowing what they are talking about will make them more sceptical. They will be more likely to accept the sceptical comments that the science is flawed, whether the theory, the computer models or the statistics. Tamino attempts a hatchet-job on a peer-reviewed paper on Australian Sea Levels. Whilst making some valid comments, it gives the misleading impression that he has overturned the main conclusion. The sceptic blogs (GWPF, Wattsupwiththat, Jo Nova) are highlighting a front page article in the Australian about a peer-reviewed paper by P.J. Watson about Australian sea levels trends over the past century. 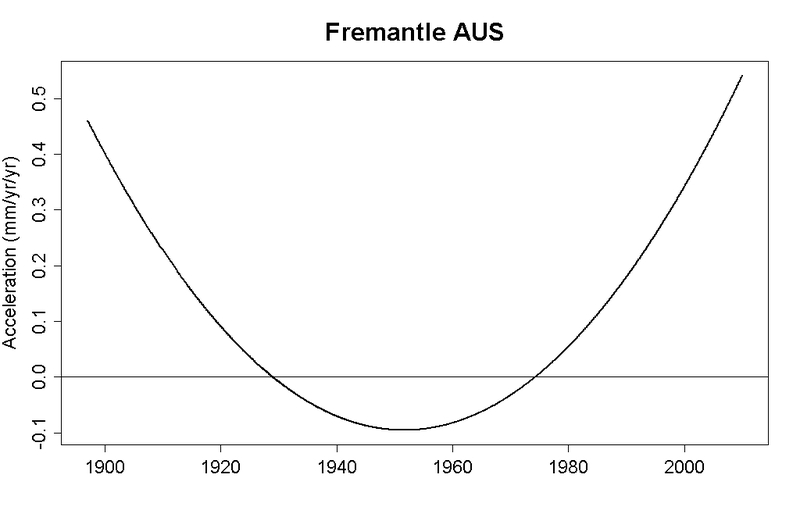 The significance is that Watson shows a twentieth century rise of 17cm +/-5cm in Australia, whilst Government policy is based a sea level rise of up to 90cm by the end of the century. If there is deceleration from an already low base, then government action is no longer required, potentially saving billions of dollars. Looking for other viewpoints I found a direction from Real Climate to Tamino’s Open Mind blog. Given my last encounter when he tried to defend the deeply flawed Hockey Stick (see my comments here and here) I curious to know if this was another misdirection. I was not disappointed. Tamino manages to produce a graph showing the opposite to Watson. That is rapid acceleration, not gentle deceleration. Chooses just one of the four data sets used. That is the Freemantle data set. Making valid, but largely irrelevant criticisms, to undermine the scientific and statistical competency of the author. Takes time to make the point about treating 20 year moving averages as data for analysis purposes. The problem is that it underweights the data points at the beginning and the end. In particular, any recent acceleration will be understated. Criticizes the modelling method, with good reasons. Slips in an alternative model that may answer that criticism. Shows the results of that model output. Tamino’s choice of the Freemantle data set should be justified, especially as Watson gives the comment in the conclusion. That is, the Freemantle data shows the largest acceleration towards the end and this extra acceleration might be because land levels are falling, not sea levels rising. The underweighting of recent data is important and could be dealt with by looking at shorter period moving averages and observing the acceleration rates. That is looking at moving averages for 19, 18, 17 years etc. If the acceleration rates cross the 20cm a century rate with the shortening of the time periods then this will undermine Watson’s conclusion. Tamino does not do this, despite being well within his capabilities. Until such an analysis is carried out, the claim abstract in the abstract that “(s)hort period trends of acceleration in mean sea level after 1990 … are not abnormal or higher than other short-term rates measured throughout the historical record ” is not undermined. Instead he flippantly inserts a quartic equation, which gives the time-varying acceleration (the second derivation) as a quadratic function against time. There are some problems with a quadratic functions as a model against time. Primarily it only has one turning point. Extend the graph far enough and it reaches infinity. So at some point in the future sea levels will reach the sun, and later the rate of rise will be faster than the speed of light. More seriously, if this quadratic is the closest fit to all the data series, it will either have, or soon will have, overstated the actual acceleration. If used to project 90 years or more ahead, it will provide a grossly exaggerated projection based on known data. On this basis I have edited to give all the inferences that can be drawn from rising sea levels in Australasia. That is, a pure maths exercise in plotting a quadratic equation on a graph, unrelated to any reality. An alternative to this is to claim simply that there is not sufficient valid data, or the analysis is too poor draw any long-term inferences. An alternative approach is to relate the sea level rises to the global temperature rises. Try comparing Watson’s graph of rate of change in sea levels to the two major temperature anomalies. First it should be pointed out that Watson uses a twenty year moving average, so his data should lag the temperature data. The strong warming in the HADCRUT data in the 1920s to 1940s is replicated in Fort Denison and Auckland sea level data. The Lack of warming in the 1945 to 1975 period is replicated be marked deceleration in all four data sets from 1950 to the 1970s. The warming phase thereafter is similarly replicated in all four data sets. The current static phase, according to the more reliable HADCRUT data, should similarly be marked by a deceleration in sea level rise from an already low level. Further analysis of Watson’s data is needed to confirm this. There is no reason in the existing data to believe that Watson’s conclusions are invalid. It is necessary to play fast and loose with the data and get lost in computer games models to draw alternative inferences. Yet if a member of the Australian Parliament says legislation to cope with sea level rise should be withdrawn due to a new study, the alarmist consensus, (who have just skimmed through Tamino’s debunking), will say that the study has been overturned. As a result, ordinary, coastal-dwelling people in Australia will continue to endure real hardship due to legislation based on alarmist exaggerations. (here & here). Find(ing) every false, misleading, scary, idiotic, non-scientific statement they have made in the past twenty years. Create an index by name with pages listing those statement with links to the source. Keep it factual. Let their own words come back to haunt them. A database of all the exaggerations, errors and false prophesies on its own will do no good. No matter how extensive and thorough and rigorous, it will be dismissed as having been compiled by serial deniers funded by big oil. Getting a fair hearing in the MSM will be impossible. It the coming battle the alarmists have decided the field of battle and have impenetrable armour. To be brief, there needs to be two analogies brought to the fore. First is the legal analogy. If there is a case for CAGW, it must be demonstrated by primary, empirical evidence. That evidence must be tested by opponents. It is not the bits, that may be true – like lots more CO2 will cause some warming. But that there is sufficient CO2 to cause some warming, which will be magnified by positive feedbacks to cause even greater warming, and this substantive warming will destabilize the planet weather systems in a highly negative way. The counter-argument is two-fold – that many of dire, immediate, forecasts have been highly exaggerated and more importantly, the compound uncertainties that have been vastly underestimated. That the case is weak is shown by the prominence given to what is hearsay evidence, such as the consensus, or the proclamations of groups of scientists, or to the image of the hockey stick. In some cases, it has been tantamount to jury-tampering. Second is the medical analogy. A medical doctor, in proscribing a painful and potentially harmful course of treatment, should at last have a strong professionally-based expectation that post treatment the patient will be better off than if nothing was done. The very qualities that make politicians electable – of being able to make build coalitions by fudging, projecting an image, and undermining the opponents by polarizing views – make them patently unfit for driving through and micro-managing effective policy to reduce CO2. They will of necessity overstate the benefits and massively understate the costs, whether financial or in human suffering. They will not admit that the problem is beyond their capabilities, nor that errors had been made. The problem is even worse in powerful dictatorships than democracies. I have tried to suggest a method (for those who are familiar with microeconomics) the IPCC/Stern case for containing CO2 here. Also, why there is no effective, global political solution possible. What is missing is why the costs of global warming have been grossly exaggerated. Jo Nova points to the excellent Keynes versus Hayek rap videos and compares with global warming views. My own observations are more to do with the nature of theory. Keynes saw the economic system as being essentially unstable. There was no tendency for the economic system to tend towards an optimal equilibrium. Rather it could get stuck for long periods with high unemployment. This seems to parallel to the notion of tipping points. The Keynesian multiplier The parallel in CAGW theory can be seen in the positive feedbacks and tipping points. When Bob Carter says that climate is homeostatic (or Warren Meyer at climate-skeptic uses his ball in a bowl illustration), they criticize the climate models for being Keynesian. I would think that the Carter/Meyer view of climate is similar to that of Hayek on economic phenomena. Climate is essentially chaotic, having only general empirical regularities. However, it has tendencies towards equilibrium. Please note that Hayek occupies a position close to Keynes this issue. Walrasian General Equilibrium with perfect knowledge and instantaneous leaps from one equilibrium to another is an extreme caricature of more mainstream economics. Here Keynes v. Hayek is more apt for the views on climate. Keynesians view all the essential features of the economic system as being essentially knowable, capable of being reasonably represented in mathematical models. Hayek calls this a “pretence of knowledge” (the title of his Nobel Prize lecture), as although we may know essential features of the system, the relationships are highly complex and changing. The problem is not just lack of measurement, it is having data that is capable of being modelled in order make manipulation of these variables possible. In economics, the manipulation is control of macro economy. In climate, it is to control the global average temperature. Keynesians believe that a few major measures are sufficient to describe an economy. CAGW theorists believe that the global surface temperature and atmospheric CO2 are key measures. Hayek questioned whether such variables were meaningful. CAGW theorists are on much shakier ground than the Keynesians here. Bob Carter points out in his book that the stored heat in the atmosphere is a tiny fraction of that stored in the oceans. When it comes to stored CO2 the problems are even greater. But when it comes to the rhetoric of global warming, the analogy should not be with Keynes, but with Karl Marx. Climate models give true scientists perfect insight into the real nature of climate. Those who are on the outside are delusional and/or are either knowingly, or subconsciously, acting as lackeys of the oppressive class. In Marx the oppressive class are the bourgeois, in climate alarmism they are Big Oil.